Ohlson Mountain Air Force Station (1958-1963) - A Cold War U.S. Air Force Station, part of the Alaska AC&W Radar Network. Initially functioned as a Ground Control Intercept (GCI) radar site, with a Permanent System ID of F-25. Located on the Kenai Peninsula south of Anchorage, approximately 5 miles north of Homer. One of two sites that could be accessed and supplied by road. Closed in 1963. 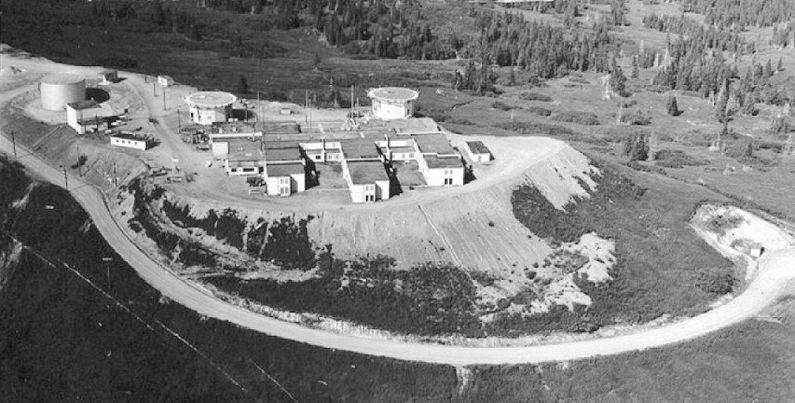 Ohlson Mountain Air Force Station before Radar Equipment was Installed. Construction began in June 1955 by Chris Berg, Inc. of Seattle, Washington under a $1,897,184 contract. The site became operational in March 1958 as Ohlson Mountain Air Force Station manned by the 937th AC&W Squadron which had been activated in 1957 to operate and maintain the site. Ohlson Mountain was not really a mountain (only 1,500') and the radar site occupied what is best described as a leveled-off ridge, with the radar site on one end and an Air-Ground radio site at the other end. Initial radar equipment included an FPS-3A search radar and one FPS-6 height-finder radar. The FPS-3 was reportedly upgraded to a FPS-20A search radar in 1961-1962 (only one source indicated the presence of the FPS-20A). Aircraft track data from these radars was manually plotted on plotting boards and passed to Manual Direction Centers on voice and teletype circuits. Intercepts of unidentified aircraft were conducted by local weapons controller teams. The closure of Ohlson Mountain AFS was publically announced in the Fairbanks Daily News-Miner newspaper on 6 May 1963 and the site ceased operations on the 15th of May 1963. Closure and deactivation of the 937th AC&W Squadron were effective on 1 Oct 1963. Ohlson Mountain AFS was a single level site and most of the facilities were housed in a large two-story composite building. Other facilities included the two radar towers, the radio transmitter, and receiver buildings, storage and utility buildings. The composite building was a large two-story structure with poured concrete foundation and wood-frame construction. Quarters were provided for 210 men. Additional functions included a radar operations room, central power/heating plant, garage, laundry, library, warehouse, dining room, headquarters, post exchange, mail room, NCO Club and officers' lounge. Two large enclosed radar towers on concrete supports were located adjacent to the composite building. A gravel road connected the site to Homer where both airlift and sealift supplies and personnel could be landed and then transported to the radar site. After High Frequency (HF) radio systems proved inadequate for command and control communications, the Air Force implemented the White Alice Communications System (WACS). This was a system of tropospheric scatter and microwave radio relay sites constructed during the mid-1950s to provide reliable communications to Alaska Air Command (AAC) AC&W system. Ohlson Mountain AFS is listed as having a co-located White Alice terminal and the Diamond Ridge White Alice station was just four miles away. Construction was started on the Diamond Ridge combination tropo/microwave station in 1956 and the station opened on 30 Mar 1957. Facilities included a 6,100 square-foot equipment building, a 720 square-foot auto maintenance shop and a 45 square-foot water supply building. The equipment building houses the communications center, power generator, radio equipment, and operators rooms. Crew quarters were not provided and the military operators would have used the Ohlson Mountain AFS facilities until it closed in 1963. After 1963 both military and civilian operators would have been on the local economy at Homer. The Diamond Ridge WACS station was acquired by Alascom in 1983 and converted to a satellite ground station that remains operational today. The 60' billboard tropo antennas were removed but the foundations can still be seen in some satellite images. In December 1964, the General Services Administration (GSA) sold the Ohlson Mountain site to a private firm for $32,500. Part of the facility was leased to the Defense Nuclear Agency from 1965 to 1978. In 1985, the AC&W site was inspected and its facilities were found to be in poor condition. In 2005, the site was environmentally remediated and there is no longer any evidence of the site. Location: Five miles north of Homer, Alaska. Denfeld, D. Colt Ph.D., The Cold War In Alaska: A Management Plan For Cultural Resources, 1994-1999, U.S. Army Corps of Engineers, August 1994, 327 pages, Pdf, page 164-165. History of the Aircraft Control and Warning System in Alaska: Air Defense of Arctic Skies, Argonne National Laboratory, Illinois, 2002 updated 2013, 140 pages, Pdf, page 21, 65-66. Reynolds, Georgeanne Lewis, Historical Overview And Inventory: White Alice Communications System, U.S. Army Corps of Engineers Alaska District, April 1988, prepared for USAF, Alaskan Air Command, Elmendorf Air Force Base, Anchorage, Alaska, 16 pages, White Alice USACE, page 12. This page was last modified 20:51, 9 January 2019 by John Stanton.